The Mekong Delta may lose half of its land to erosion because of rampant sand exploitation. In an interview with the Lao Dong (Labour) Newspaper on April 23, Dr Dao Trong Tu from the Vietnam River Network said climate change was not the main and only cause of the erosion in the Mekong Delta. He blamed rapid urbanisation in coastal areas and bad practices. "The three and four-storey houses that weigh tens of tonnes put huge pressure on the land. The hydropower plants prevent alluvial soil from getting downstream. Moreover, illegal sand exploitation in this area is worsening the situation," he said. There are about 265 erosion spots in the Mekong Delta region covering 450-kilometres of coastal areas. The erosion rate at Ca Mau Peninsula is 12.2 metres per year. 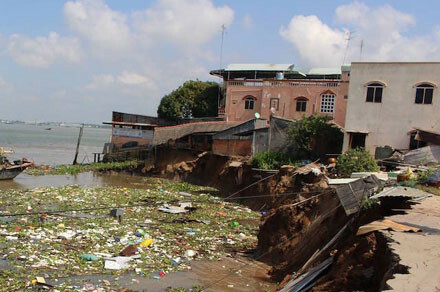 70% of the coastal area is being threatened by erosion. Dong Thap Province also has many erosion spots and loses about 500 hectares of land annually. By 2050, the lives of one million residents in the Mekong Delta will be badly affected by erosion. Statistics from the Institute for Climate Change at Can Tho University show that sea levels only rose 4mm but the underground water exploitation caused 2 centimetres of subsidence which exacerbated the situation. The Southern Institute of Water Resources Research reported that the sea level in the Mekong Delta rose by 12cm in the past 50 years. Le Anh Tuan, vice head of the Institute for Climate Change – Can Tho University said the Mekong Delta would lose half of its land in the next hundreds of years because of illegal sand exploitation in Vietnam, Laos and China hydropower projects on the Mekong River and increasing water usage in Thailand. "We must stop the rampant sand exploitation. If it is necessary, dredge the canals for inland waterways and use those soil and sand to fill up the eroded areas. It's costly but necessary," he said. The Southern Institute of Water Resources Research said various measures must be applied at the same time including building embankments and planting mangrove forest to protect the beach. In the long term, Tang Quoc Chinh, deputy chief of the National Committee on Natural Disasters Prevention and Control's Office, also agreed. "Erosion in the Mekong Delta is caused by the development upstream on the Mekong River which is affecting socio-economic development. We also need to research about the impacts from socio-economic development to ensure that the residents can live in harmony with nature," said Deputy Minister of Agriculture and Rural Development Hoang Van Thang.